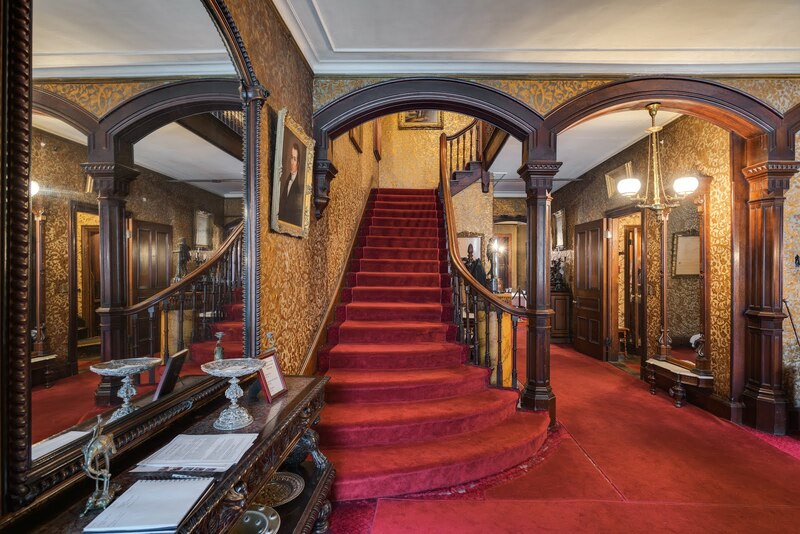 A century ago, most Bostonian women of a certain social standing participated in any one of the numerous, yet highly exclusive, women’s clubs in the city. Exclusivity characterized the nature of the clubs, but the majority actually focused their energy on various types of charity work—a noblesse oblige approach to social groups. The Vincent Club was one such philanthropic organization. 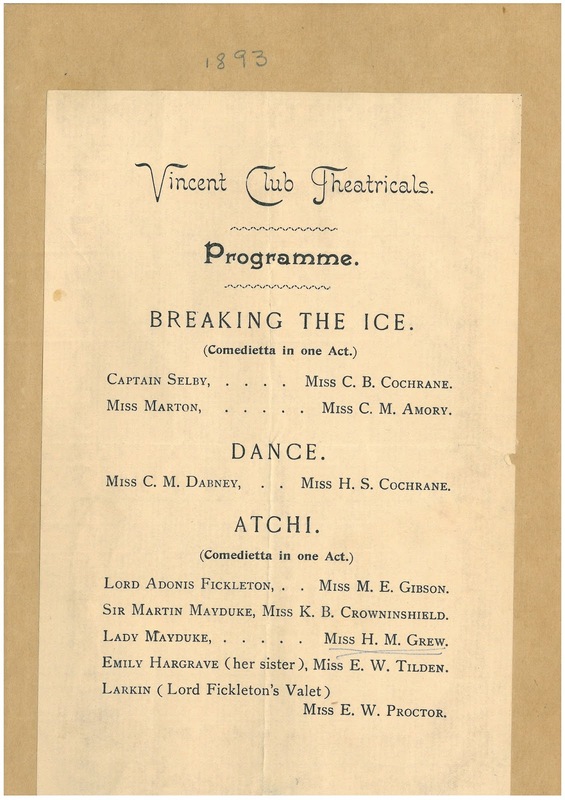 Founded in 1892, the club originated to support the Vincent Memorial Hospital, established one year earlier in the memory of Mary Ann Vincent, a magnanimous Boston actress. The Vincent Memorial Hospital, originally located in the West End, filled a niche in Boston; the hospital’s medical staff cared primarily for wage-earning, indigent women. Mary Ethel Gibson (1873–1938), referred to in the Boston Daily Globe as having “always been popular in society,” was a founding member of the Vincent Club along with her mother, Rosamond Warren Gibson (1846–1934). 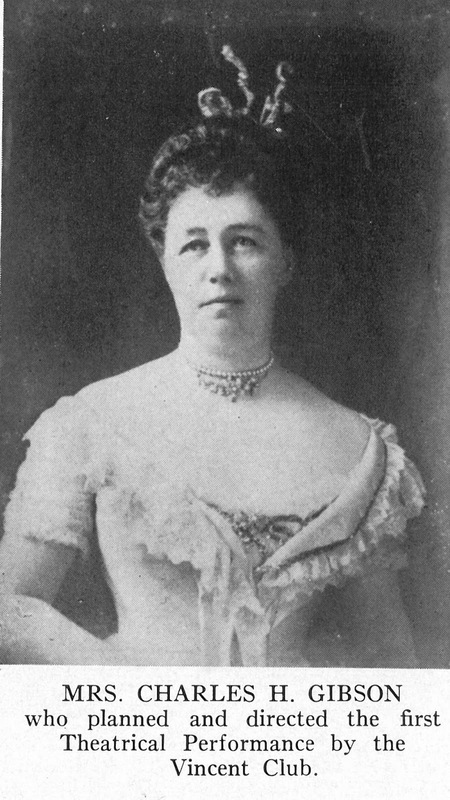 Rosamond planned and directed the first theatrical performance, while Mary Ethel performed in that 1893 show, starring as a man named Lord Adonis Fickleton. In 1941, the Vincent Memorial Hospital merged with Massachusetts General Hospital, providing gynecology services while maintaining its own identity. When the Vincent let its independent hospital license expire in 1988, MGH agreed to keep the VMH’s name associated with its former programs. The Vincent Club is still extant, with a current membership of 1,200 women. A fancy spring gala has since replaced the Vincent Show as the main fundraising event. Male attendees are welcome at the gala, as the “no men allowed” rule was rescinded in 1920. “Boston's Vincent Club: Elite and Thriving.” New York Times (1923–Current File), Feb. 20, 1971. http://proxy.bc.edu/login?url=http://search.proquest.com.proxy.bc.edu/docview/119389407?accountid=9673. 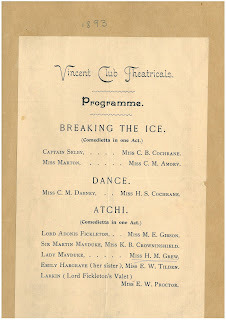 Laura Haddock, “Traditional Vincent Club Drill to Renew Memories of Show’s Women’s Activities.” The Christian Science Monitor (1908–Current File), Feb. 28, 1947. http://proxy.bc.edu/login?url=http://search.proquest.com.proxy.bc.edu/docview/515991751?accountid=9673. “History,” Vincent Memorial Hospital, http://vincentmemorialhospital.org/history/. “Mary Gibson a July Bride.” Boston Daily Globe (1872–1922), Jul. 21, 1911. http://proxy.bc.edu/login?url=http://search.proquest.com.proxy.bc.edu/docview/501764479?accountid=9673. “Society Women in a Vaudeville Show.” Boston Daily Globe (1872–1922), Apr. 28, 1899. http://proxy.bc.edu/login?url=http://search.proquest.com.proxy.bc.edu/docview/499054147?accountid=9673. “Vincent Club Headliners Through.” Boston Daily Globe (1928–1960), Mar. 22, 1959. http://proxy.bc.edu/login?url=http://search.proquest.com.proxy.bc.edu/docview/250878367?accountid=9673. “Vincent Club Revue Promises Gala Opening.” Boston Daily Globe (1928–1960), Mar. 8, 1936. http://proxy.bc.edu/login?url=http://search.proquest.com.proxy.bc.edu/docview/815157287?accountid=9673. Gail Wetherby, e-mail message to the author, August 12, 2016.